Millions of people across India invest in the stock market. Indeed, stock trading- meaning buying and selling shares of companies- is since long one of the most favorite ways of people to get rich quickly. Understandably, some strike it big while others are not as fortunate. 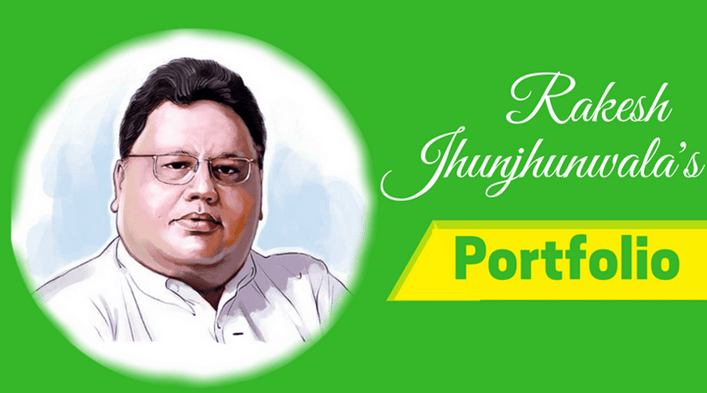 One such a personality who has made it really big on Indian stock markets is Rakesh Jhunjhunwala. At the age of 57, he is ranked as the 53rd wealthiest person in India. Rakesh Jhunjhunwala’s portfolio and personal assets are estimated at whopping US$ 2.5 billion. Rakesh Radheshyam Jhunjhunwala is an Indian businessman and trader. He also holds qualification as Chartered Accountant. Rakesh Jhunjhunwala is a partner in the reputable asset management firm, RaRe Enterprises. The name ‘RaRe’ finds its origin to Rakesh and Rekha, his wife. Additionally, Rakesh Jhunjhunwala is also the Chairman of Hungama Digital Media Entertainment and Aptech Limited. Furthermore, he is a member of Board of Directors of several top Indian companies including Geojit BNP Paribas Financial Services Ltd, Provogue India Ltd, Mid-Day Multimedia Ltd, Prime Focus Ltd, Viceroy Hotels Ltd, Bilcare Ltd, Nagarjuna Construction Co Ltd, Praj Industries Ltd, Concorde Biotech Ltd, Top Securities Ltd, Innovasyth Technologies (India) Ltd, among others. Born into a Marwari family on July 5, 1950, Rakesh Jhunjhunwala graduated in commerce from Mumbai’s Sydenham College. Rakesh Jhunjhunwala often features in Indian newspapers and magazines. He is often described as an investment wizard with Midas touch. Rakesh Jhunjhunwala’s RaRe Enterprises has rather humble beginnings. He invested a modest Rs.5,000 in stocks, almost three decades ago. His inspiration to invest on the stock markets came from his father, an officer at the Income Tax Department. In November 2017, there are various estimates of Rakesh Jhunjhunwala’s net worth. India’s premier business daily, Financial Express pegs his net worth at about US$ 2.4 billion. Forbes also states his wealth at US$ 2.4 billion. A few independent observers however estimate he is worth US$ 3 billion or more, but these reports cannot be verified. Between 1986 and 1989, Rakesh Jhunjhunwala made large investments in blue-chip companies including Tata Power. The share price of Tata Power rose to nearly Rs 1,200 each. This surge in the stock price made Rakesh Jhunjhunwala’s assets double- from nearly Rs. 2 million to Rs. 5.5 million. At the time, the stock market index stood at 150 points only. However, his first major investment was in an iron ore mining company, Sesa Goa, now called Vedanta Ltd. Rakesh Jhunjhunwala bought whopping 400,000 shares of this company, which was in financial doldrums due to depression in iron ore prices. He bought some 250,000 shares at an average price of Rs. 65 each. Later, he bought an additional 100,000 plus shares of Sesa Goa at an average price of Rs.150. The gamble in Sesa Goa stocks indeed paid rich dividends to Rakesh Jhunjhunwala. Prices of these shares rose to Rs.2,200 each. Additionally, he traded some more stocks too. This trading would result in Rakesh Jhunjhunwala’s portfolio and net worth jump to a whopping Rs. 25 million. Another major company in Rakesh Jhunjhunwala’s portfolio is Praj Industries Ltd, an Indian major in the Ethanol plant sector. He invested in Praj Industries when the index stood at 5,500, in January 2004. However, since the index has shot through the roof to stand at nearly 12,000 points. Rakesh Jhunjhunwala sold some of the stock in this company with an appreciation of 250 percent. Geojit BNP Paribas Financial Services Ltd: Stocks of this company shot up by 292 percent by September, 30 2017, or the end of the second quarter (Q2) of financial year 2017-2018. Rakesh Jhunjhunwala holds 9.51 percent stocks of this company. Prakash Industries Ltd: Witnessed a surge of 217 percent in share prices by September 30, 2017. Rakesh Jhunjhunwala’s portfolio includes 1.64 percent holding. Edelweiss Finance: Stock prices increased by 195 percent by September 30, 2017. Rakesh Jhunjhunwala holds 1.05 percent of Edelweiss Finance’s stocks. Dewan Housing Finance Corporation Ltd: Shot up by 144.32 percent during Q2 of fiscal year 2017-2018. Rakesh Jhunjhunwala’s portfolio includes 3.19 percent shares of DHFL. Escorts Ltd: Rakesh Jhunjhunwala holds 9.16 percent stocks of this large tractor and mobile cranes manufacturer of India. Share prices of Escorts Ltd increased by 142.91 percent up to September 2017. VIP Industries Ltd: Here, Rakesh Jhunjhunwala’s portfolio includes some 3.69 percent of the company’s stocks. Share prices of VIP Industries Ltd grew by 124.51 percent by the end of Q2 of financial year 2017-2018. Delta Corp Ltd: In this Indian real estate, gaming and hospitality major, Rakesh Jhunjhunwala holds a 8.43 percent stock. Prices of Delta Corp Ltd’s stocks shot up by 106.82 percent. Rakesh Jhunjhunwala and his RaRe Enterprises reduced their shareholding in five companies during the second quarter of financial year 2017-2018, which ended on September 30, 2017. They include Viceroy Hotels, Aurobindo Pharma, Bilcare, JPAssociates, and TV18 Broadcast. ION Exchange India Ltd: where he holds 3.94 percent stock. Anant Raj Group: Some 3.22 percent shares are held by Rakesh Jhunjhunwala. NCC Telecom Ltd: He holds about 8.12 percent stocks. Lupin Labs Ltd: Rakesh Jhunjhunwala’s portfolio includes 1.89 percent stocks of this Indian pharmaceuticals major. Federal Bank Ltd: During Q2 of the current financial year, Rakesh Jhunjhunwala reduced his stockholding in this bank from 2.15 percent to 1.82 percent. Orient Cement Ltd: Where he holds some 1.22 percent of the company’s stocks. Fortis Healthcare Ltd: This company was added to Rakesh Jhunjhunwala’s portfolio during the first half of fiscal year 2017-2018. He now holds 1.54 percent stocks of this company. In January 2017, Rakesh Jhunjhunwala’s wife Rekha, signed an agreement with HSBC Bank to buy the entire building called Ridgeway Apartments. Four years earlier bought six apartments in this sea-facing building located in Mumbai’s upscale residential area, Malabar Hill at a price of Rs.17.6 million. Rakesh Jhunjhunwala and his wife also live in this building. The deal with HSBC Bank is reported to be worth Rs.19.8 million. The couple intend to raze this building to ground. Later, they will build a grand bungalow. Rakesh Jhunjhunwala’s house will most likely be one of the landmarks of Mumbai, when complete. Of course, such a palatial house is befitting tribute to a man who has struck it rich in his own right and is a self-made billionaire. As we have seen, Rakesh Jhunjhunwala did not inherit a fortune from his family. Rather, he began his career as a Chartered Accountant and went on to become the 53rd wealthiest man in India. Rakesh Jhunjhunwala was a middle-class investor, who struck it big by merely following his business instinct backed by proper research. Indeed, Rakesh Jhunjhunwala serves as an inspiration for millions of Indians who want to become rich. However, he cautions that getting rich is not an overnight business. It takes years of patience, research and common sense.